The theme of NEMS is robotic grasping and manipulation research, which includes perception, mechanics, and algorithms. The purpose of NEMS is to bring together researchers in the Northeast with these interests to talk about their work and to foster collaborations. Additionally, NEMS gives students a chance to present their work and discuss ideas. In 2015, NEMS had about 80 participants from 25 institutions. The 12th annual New England Manipulation Symposium (NEMS) will be held at Northeastern University on June 9th, 2017. Attendance (Deadline June 1): There is no registration fee to attend NEMS. If you plan to attend, please send an email to kohler.c(at)husky.neu.edu with the subject “Attending NEMS 2017” and a message containing your name and affiliation. Please indicate whether you will need a parking pass. Lunch will be provided. Presentation (Deadline May 15): If you are interested in giving a presentation on your work at the symposium, please register and email an informative title, the names and affiliations of the authors, and an abstract to kohler.c(at)husky.neu.edu with the subject “Presenting at NEMS 2017”. Topics should be related to robotic manipulation, but can otherwise span any range of sub-topics. We expect each speaker to have approximately a 20min slot. Poster (Deadline May 15): If you are interested in presenting your work in the poster session, please register and email an informative title, the names and affiliations of the authors, and an abstract to kohler.c(at)husky.neu.edu with the subject “Poster at NEMS 2017”. The scope of the posters can lie outside of the scope of the conference, but should be on a topic that will likely be of interest to the attendees. All posters should be “A0” size (33in x 46in). They can be either horizontal or vertical. We are providing cardboard backing and easels. Demo (Deadline May 15): If you are interested in presenting your work as a demo, please register and email an informative description of the demo to kohler.c(at)husky.neu.edu with the subject “Demo at NEMS 2017”. 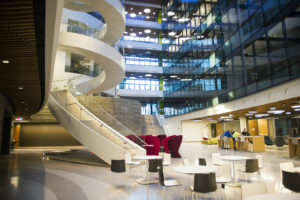 NEMS 2017 will be held in the new Interdisciplinary Science & Engineering Complex (ISEC) at Northeastern University, Boston MA. ISEC is marked by the gold star surrounded by the red circle on the map below. To get to Northeastern using public transportation, take the orange (subway) line to Ruggles station or the green E (subway) line to Northeastern University station. 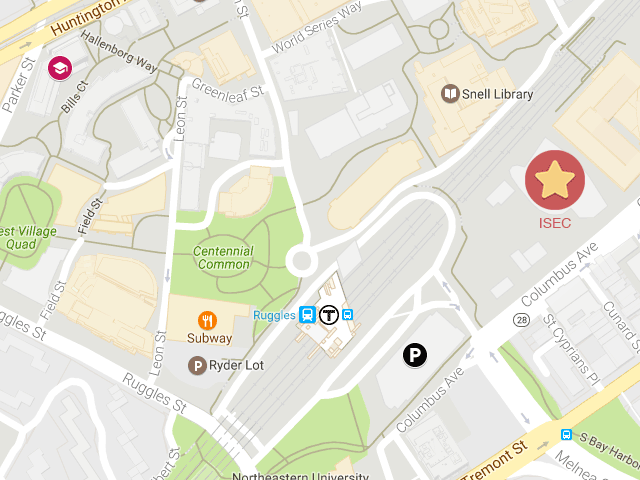 Ruggles is also a commuter rail station, and there are a number of buses that stop there. The map below shows subway MBTA stations marked with a “T” logo and West Village H is marked by a red circle and white graduation cap. If you’re driving, then you should park in the Renaissance parking garage on Northeastern University’s campus (shown in black on the map below). At the event we will hand out parking passes so that you can exit the garage without having to pay the fee. If you need a parking pass but haven’t requested one yet, please email kohler.c(at)husky.neu.edu so that we request the correct number of passes. NEMS 2017 is co-organized this year by Rob Platt and Peter Whitney. For registration and other administrative issues, please contact Colin Kohler, kohler.c(at)husky.neu.edu.